Join us for the 2015 NAGPS Northeast Regional Conference! 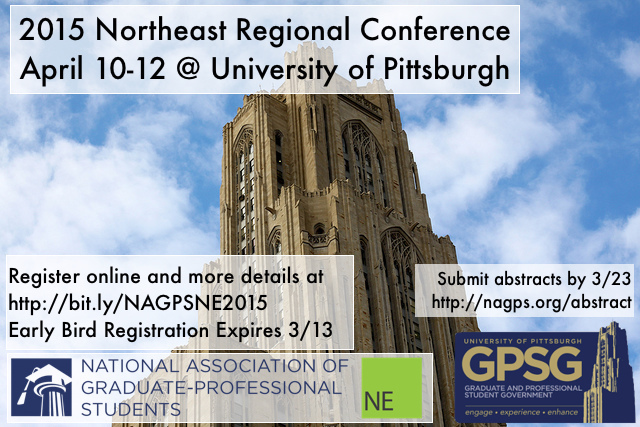 The National Association of Graduate-Professional Students (NAGPS) would like to welcome you to the 2015 Northeast Regional Conference! This annual conference brings together graduate student leaders from the Northeast region. Please check out the 2015 NAGPS Northeast Regional Conference Facebook page for updates! Conference activities will take place at the William Pitt Union , located at the heart of the University of Pittsburgh’s campus and a short 5 minute walk from the hotel. For conference attendees coming in from outside of Pittsburgh, it is easy to access the University campus via public transportation. Real time bus information can be viewed on the Transit and Tiramisu smartphone apps. From the airport. The 28x Airport Bus travels directly from Pittsburgh International Airport (PIT) to the University of Pittsburgh campus and conference hotel. Bus drivers do not carry change; buses accept cash only. Fare to or from the airport is $3.75 for one direction. From Downtown (Megabus/Greyhound/Amtrak). Take the 71A/B/C/D from Downtown to Fifth Avenue and Tennyson. Bus drivers do not carry change; buses accept cash only. Fare to or from downtown is $2.50 for one direction, $3.50 for round-trip (includes 3 hour transfer). The full list of abstracts and roundtables can be found in the conference program. NAGPS regional conferences serve as a forum where student leaders from the region come together to share best practices, learn about national platforms, and grow in their understanding of issues relevant to graduate students in the Northeast. The conference presentations are a great opportunity to highlight your organization, as well as to learn from the wisdom of your fellow student leaders. Presentations are typically 15-20 minutes in length with 10 minutes for questions. Many presentations are roundtables, which allow conference attendees to directly share experiences and focus discussion around major issues. The theme of this year’s conference is sustainability. If you are unsure of a presentation or roundtable topic, here are some suggestions, following the four traditional pillars of sustainability: culture, politics, economics, and environment. If you are interested in hosting the 2016 Northeast Regional Conference, you must submit a letter of intent to the NAGPS Executive Committee (excomm@nagps.org) AND Regional Chair (nerc@nagps.org) before the regional conference, April 10th, 2015. This letter shall provide two important elements: (1) approval of the graduate-professional student organization (GPSO) to host the regional conference; this can include approval from your GPSO, Dean, or Administrator, and (2) a named Director of Regional Conference to coordinate planning and volunteers of the regional conference (the Director must be a member of the host organization). A detailed schedule can be found in the full conference program. As a region, we meet once a year at our Regional Conference to discuss the issues and concerns that are important to graduate and professional students across the region. The Regional Conference is one of the best venues and opportunities to network and meet other leaders across the Northeast and exchange best practices of your graduate organizations. On behalf of the Northeast Regional Board, we are excited for you to come join us this year at the University of Pittsburgh.